Anchorage, Alaska - Former Alaska House Speaker Pete Kott was convicted Tuesday by an Anchorage jury on charges of bribery, conspiracy, and extortion. Kott faces a maximum sentence of 20 years in prison on the extortion charge, a maximum sentence of 10 years on the bribery charge, and a maximum sentence of five years on the conspiracy charge. Kott was tried on four federal charges: conspiracy to solicit financial benefits for his service as a legislator, extortion "under color of official right," wire fraud, and bribery. 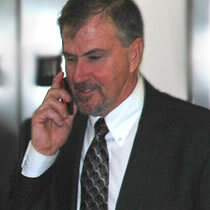 Jurors found him not guilty on the one count of wire fraud. Kott, along with multiple unindicted co-conspirators, dubbed themselves the "Corrupt Bastards Club" and even had hats made with a "CBC" logo on them. Kott was accused of accepting around $12,000 in financial benefits in exchange for his votes and influence on 2006's Petroleum Profits Tax. VECO founder Bill Allen testified during the trial that VECO employees worked on a remodeling of US senator Ted Stevens' Girdwood resort house in 2000. Allen is cooperating in a massive FBI corruption investigation that as of September 25th, 2007, has snagged two of the state's three members of Congress, one of their aides the ex-president of the state Senate, four state legislators, and two VECO executives. Prosecutor James Goeke summed up the whole case by saying in closing arguments - "the evidence in this case is overwhelming." Governor Sarah Palin issued this statement following today's guilty verdicts in the federal corruption trial of former state Representative Pete Kott. "The process was fair and the jurors should be commended for their careful consideration of the compelling evidence that was before them. I was shocked by some of the revelations that came out in the trial and I can understand why many Alaskans feel betrayed. But I am confident that this conviction is also a step forward to restoring the public's trust. Given the implications of this verdict on the passage of last year's PPT legislation, I am more committed than ever to seeking a fair, untainted solution to our petroleum tax system." "This verdict is an important victory for the people of Alaska, who deserve to expect honest, ethical representation from their elected officials," said Assistant Attorney General Alice Fisher of the Criminal Division. "I thank the prosecutors and the FBI and IRS agents who worked on this case. Their effort shows that the Department of Justice will work hard to bring to justice any elected officials who betray their duties to their constituents."